A little rain never hurt anyone–unless you’re in a survival situation. When you’re bugging out into the woods, the sound of rain falling on the ground can be anything but soothing. And you’re not exactly off the hook when you’re bugging in either. When that seemingly harmless drizzle turns into a torrential downpour, your underground bunker can quickly become flooded, leaving your carefully cultivated survival gear and supplies wet, unusable, and floating away to who knows where! So what’s a prepper gotta do? Well, waterproof your stockpile, that’s what! Here’s everything you need to know about waterproofing your survival gear and emergency supplies. Of course, you wanna keep your survival food safe and dry! But to do so, you must consider these two factors: location and storage. The goal is to stockpile food that will be edible through the crisis and beyond, so where you store your food is critical. Basements are generally a good choice for storing food. But, keeping things dry is often a challenge. Heavy rain can leave the floor wet. And even if there’s no flooding, a storm can still get the humidity levels up, causing damage to anything stored and unsealed. Install gutters and downspouts. They will help direct the flow of water away from your foundation. Use a dehumidifier to get rid of excess moisture. The size of dehumidifier you need will depend on your big your basement is. Put some rocks and gravel around the periphery of the basement. This is an inexpensive yet effective method for keeping moisture from accumulating around the foundation of your house. Use exhaust fans to improve ventilation. Seal your floor and interior walls. Take note, though, that a sealant isn’t suitable for fixing cracks or existing leaks. Catch cracks early. All it takes is one small crack to let water begin seeping into your home. Inspect your basement regularly for cracks or holes because the sooner you notice them, the easier they are to fix! Insulate cold water pipes to prevent condensation from building around them. Aside from the location, you’ll also want to select the proper containers to store your food in. Standard packaging for items like pasta, crackers, and beans won’t work for the long-term since they aren’t waterproof and deteriorate over time. Mylar bags – These metalized baggies are an excellent choice for DIY food storage. They’re strong and tight, light and flexible, and most importantly, waterproof. Mylar bags are available in various sizes and thickness. You can use them to store anything from small food items such as spices, dehydrated meats, and fruits, to larger bulk grains such as rice, beans, and heat. Food-grade buckets – One of the best ways for keeping your survival food waterproof is by using food-grade buckets. They’re light, durable, and airtight (and you know, when something’s airtight, it’s also watertight). Many preppers also use 5-gallon mylar bags to line the inside of the buckets as this will help food stay fresh for very long periods of time. Plastic containers – Wanna store food on the cheap? Use clean and emptied plastic bottles. All you have to do is put a piece of plastic wrap over the top and then secure the bottle cap on. What’s great about this method is that it’s cheap and easy, shatter-proof, and relatively waterproof. This isn’t recommended for long-term survival food storage, however, because rodents can easily chew through plastic bottles. Plus, plastic toxins may leach into your food (but when SHTF, this may be the least of your worries!). You can already find tons of tents out there with rugged strength and legit waterproof credentials. But here’s the thing–even the best tents won’t stay waterproof forever. So it’s a must that you know how to shore up your shelter’s impenetrability. After all, nobody wants to wake up in the middle of the night to a soaked and soggy sleeping bag! First things first, spread and set your tent up in a sunny area so you can inspect all the seams properly. It’ll be more efficient if you put the fly on inside out since you will be applying the seam sealer on the underside of the fly as well as in the inner side of the tent body. Check for areas where the seam tape is coming loose, then gently remove the sections that are peeling off. Next, get a rag and clean the seams with some rubbing alcohol. Spread the sealer along the inside of the seam. Make sure to get the correct type of sealer for your tent–silicone fabrics and polyurethane-treated tents typically have different sealers. Leave it to dry. It usually takes 24 hours for most sealing products to dry, so make sure you have enough space to spread out your tent. Start by gently cleaning your rainfly or tent floor to remove the flakes. You can use a sponge along with rubbing alcohol to scrub off the bits. Next, apply a coat of paint-on polyurethane sealant to the fly or on the tent floor, as per the product’s instructions. Leave the new coating to dry for at least 24 hours before storing your tent. Take note that if your floor is failing, there’s no point repairing and re-applying urethane coating on it. So better scout for new options. Perhaps your once-trusty waterproof tent is now showing signs of age, with rain no longer beading up on your fly. If this is the case, try refreshing your shelter’s durable water repellent (DWR) coating. Set up your ten and wash it down, making sure it’s free from any dirt or grime. Spray down the fabric with your waterproofing spray. Make sure you apply the coating evenly. Once the DWR coating ha set, get a damp cloth and wipe away the excess. Wait for the tent to dry before you pack it away. Waterproof sprays and sealers will come in handy if you wanna stay comfortable even if you get caught in the rain. Most sprays today work well for leather, nylon, and canvas fabrics. Just make sure you use it on clean and dry clothes, otherwise the coating won’t stick. If you have canvas clothing or shoes, natural beeswax will help them survive erratic weather. All you have to do is rub it directly on the clothing, making sure everything is covered evenly in wax. Wax candles are also an excellent substitute if you can’t find any beeswax. First, mix two cups of laundry detergent in two gallons of warm water. Soak the clothes in the solution for a couple of minutes, and then hang to dry. Create another solution containing one cup of alum and 2 gallons of warm water. Soak the fabric in the solution for at least 2 hours, and then air dry. Use a high-quality dry bag. Keep your precious items (like your electronics, toiletries, and maps) moisture-free with a high-quality dry bag. Dry bags are commonly made with vinyl or nylon. They are designed to be completely waterproof and can be fully immersed in water. Vinyl dry bags boast much heavier construction and durability. However, if you want excellent wear-to-weight ratio, nylon dry bags are the way to go. You can never be too prepared. Keep your maps and other essential items in zip-lock bags before packing them in your dry bag. A lot of preppers swear by water storage containers like WaterBricks for emergency water stockpiling. Well, since they’re obviously waterproof, you can also use them to store your food, documents, and any other survival gear and supplies that you want to keep safe and dry. Ward off the icy grip of death when SHTF by starting a fire. It ain’t easy, though, so better have some waterproof matches on the ready. The fastest way to waterproof your matches is to dip them in melted wax. You can also coat the match heads with nail polish. Crossing a river? Wading through floodwaters? Put your bug-out bag in a trash bag to make a DIY flotation device. 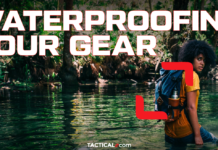 Waterproofing your survival gear and supplies is a must if you wanna stay alive and kickin’ no matter the weather in a SHTF scenario. So keep your food safe and dry, prep your tents and wardrobe, and be ready for any water situation–be it drizzle or downpour. Any waterproofing tips we missed? Don’t forget to share in the comments below!